Breathtaking entrances for Scottsdale Arizona homes are available to you. Although a global industry, our largest decorative iron market is located in the Phoenix Arizona areas. 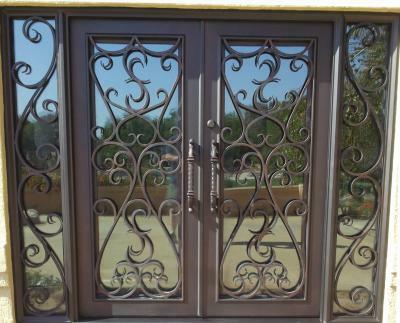 This Scottsdale family chose everything about this double iron door with sidelights. Custom builds are fun and practical with our iron designers and technicians. Their impressive and large front yard is enhanced with their door’s reflective glass. Call us and come visit our showroom in Phoenix Arizona to find out your iron door possibilities.